You’d think a list of 10 E-book covers I like wouldn’t be that hard to compile, but it actually took me a while. Part of teaching myself how to create an effective and attractive e-book cover is to study those I like and don’t like. Believe me, if I wanted to list the ones I didn’t like, that would be EASY. I won’t do that because I’d rather focus on the positive. So what makes a good e-book cover and how is that different than a regular hard copy cover? First of all, an e-book cover needs to be strong design while only being 3/4 of an inch tall thumbnail size. It has to make you stop and pause when you’re scrolling through the thousands of books for you to choose from. How do you accomplish this? Well, in my opinion, to start with you need a strong image and a title bold enough to be read. I’m talking about fiction books here for the most part, but I would imagine really this would apply to pretty much any e-book. The image can’t be so distracting that you don’t read the title first. The image should in someway enhance the title, give you some clue as to where the book is heading. Say that name of the book is “He didn’t like her”, and the cover image was of a woman in front of a blackboard holding a ruler. Well, right off the bat, you know it was his teacher he didn’t like. But why didn’t he like her?? See, you’re wondering now. I’d call that an effective cover image. 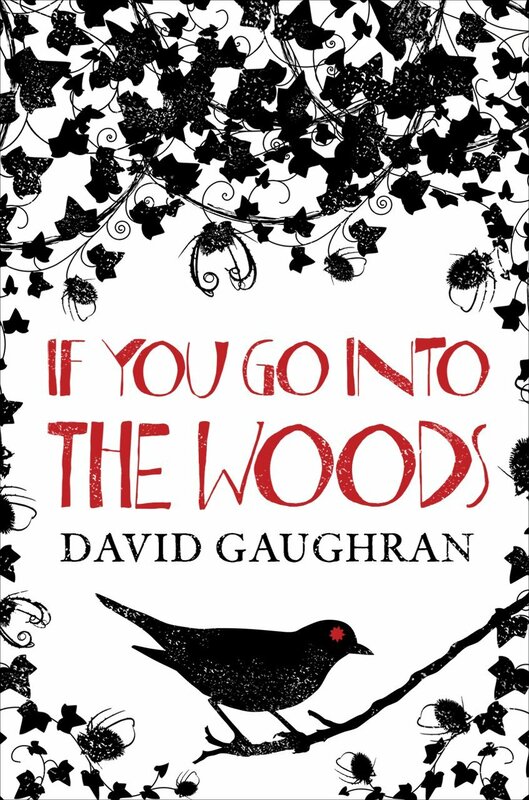 “If You Go into the Woods” by David Gaughran: Simple graphics, easy to read title and it makes me curious as to what will happen if I go into the woods. By the bird’s ominous red eye, I’m assuming nothing good. 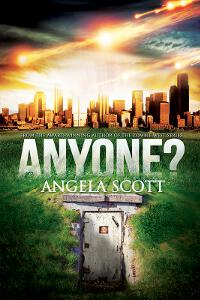 “Anyone?” by Angela Scott: Great imagery that despite its intricacy stands up to thumbnail size. Even though it kind of has two pictures in it, I don’t find it distracting at all. 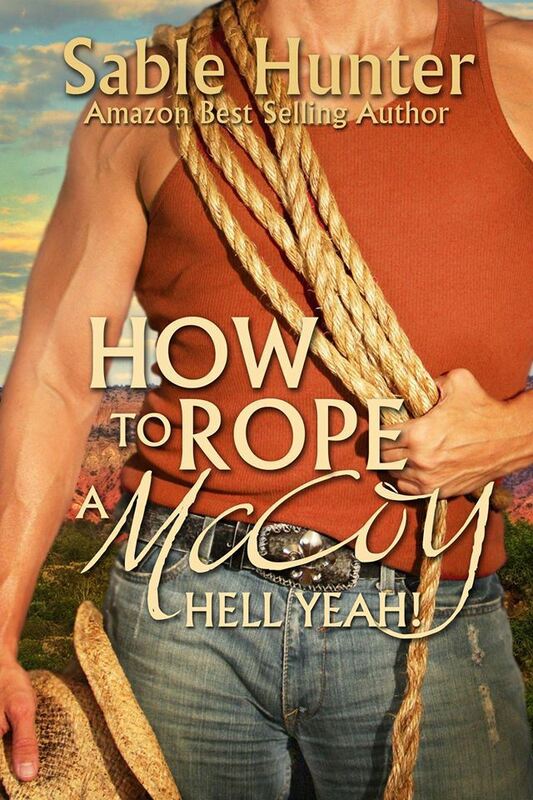 “How to Rope a McCoy” by Sable Hunter: Romance books seem to think they need to have a shirtless hunky guy on the cover and that’s pretty much it. Sure, I love a hunky shirtless guy as much as any girl, but I’d like the cover to be a bit more than that. While most of Sable’s covers fall into the Shirtless guy category, this cover says what it needs to say and pulls you in. Quite frankly, in a sea of shirtless hunky guys, it stands out and that’s exactly what a book cover should do, make you stand out from the crowd. Plus Romance covers are always showing you the faces of the couple on them. I really hate that as when you read the book, the protagonist has dark hair, but on the cover she’s a blonde. This cover gives you the suggestion while keeping the mystery. 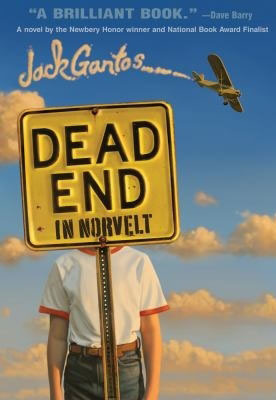 “Dead End in Norvelt” by Jack Gantos: While I was scrolling through the endless thumbnails of covers, this one stood out. How very creative it is! I love the way the author’s name is written in the clouds. I have no idea what the book is about, but the cover is super strong in thumbnail size and the image intriguing enough that I had to stop and give it a looksy. 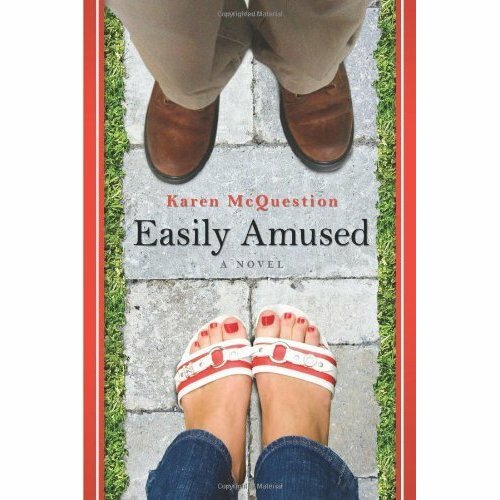 “Easily Amused” by Karen McQuestion: First of all, what a great last name! McQuestion, I love it!! This cover image was so different from everything I saw that really had to stop and see what the book was about. While the title seems bold enough in the above photo, it got a little lost in the pavement in thumbnail size. Fortunately the image alone was enough to make me stop. My only real question is why don’t their feet/legs cast any shadows? “Feast of Fates” by Christian A. 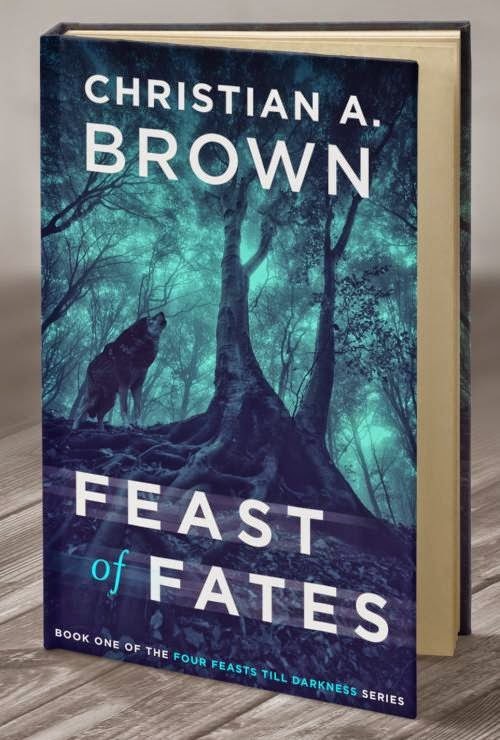 Brown: I guess I like misty mysterious book covers. Seems I found a bunch of them, but this one attracted me the most. The e-book cover is the same as this hardback cover by the way. The title is bold and doesn’t get lost at the bottom of the image. The wolf in the woods suggests what the book is about. The Author’s name, while very bold, still doesn’t distract from the overall composition. Yep, I really like this one a lot. 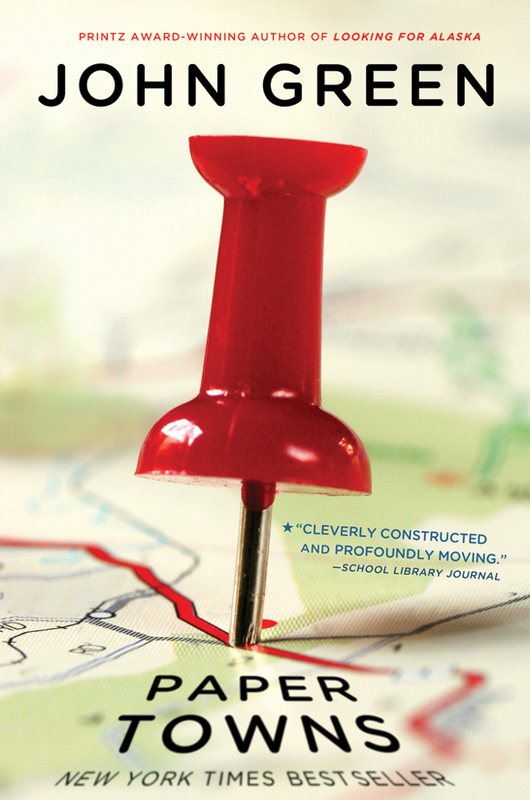 “Paper Towns” by John Green: OK, I’ll admit it, I hated the book cover for Fault In Our Stars, another John Green novel. BORING in my opinion and totally something I’d pass by. But with Paper Towns, I had to stop and check it out. What a super strong image. Yes, it distracts a little from the title, but the overall composition is strong enough that it pulls you in. Again, it’s different than the same old same old you seem to see. Thankfully John didn’t fall into the popular author’s trap of making his name the overwhelming presence on the cover. I really hate that. 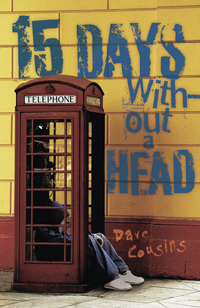 “15 Days Without a Head” by Dave Cousins: Such strong, unusual imagery. Even though I’m not crazy about the lettering, it’s different and bold enough to attract the eye. The reason I’m not crazy about the font is that it ‘suggests’ that’s it’s graffiti, but clearly it’s not. After you look at it for a minute, you start to wonder about that. But it’s that first glance that’s important in an e-book cover, you have to grab the reader right off the bat with strong imagery and titles. This cover definitely does that. 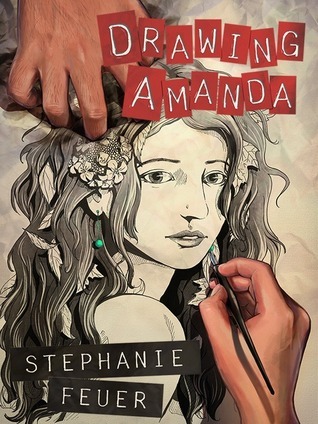 “Drawing Amanda” by Stephanie Feuer: I really like this cover. The image of the girl is crisp and eye-catching and the strong font style is easily readable. 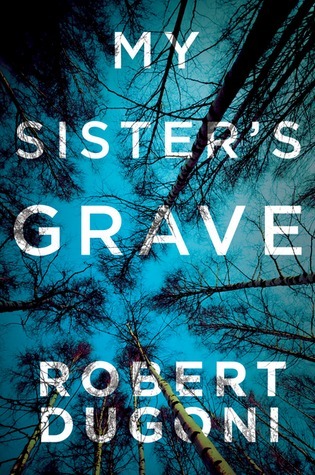 “My Sister’s Grave” by Robert Dugoni: I really love this one. It’s a strong enough image that it let them put the lettering right over the top of it and not distract from the overall image. I kind of feel like I’m the sister, looking up out of my grave. Well, that’s my list for now. I’ll be adding to it as I come across more. If you have any suggestions of great covers for me to check out, I’d love to hear about it!! ← 20 Jan 2015: Is there a Homonym for the word Homonym?